The Rheinsteig Trail runs for 320 kilometers from Bonn to Wiesbaden, passing by castles and through vineyards on the east bank of the Rhine River. 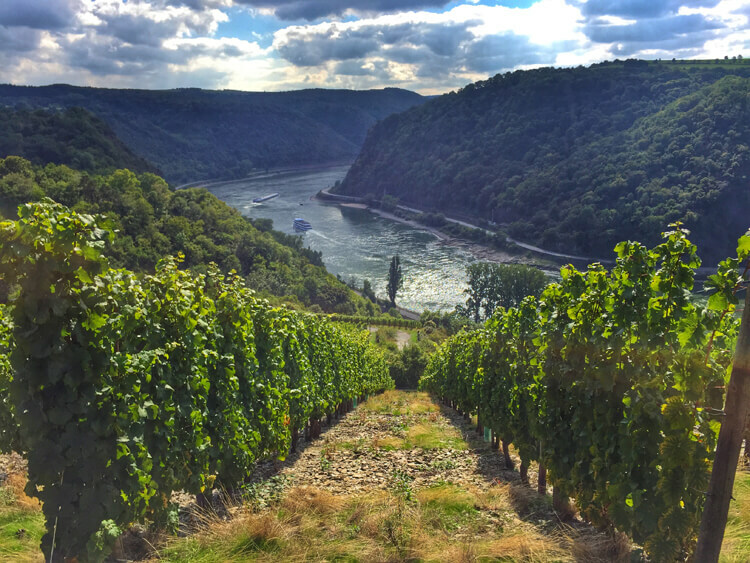 The perfect combination of adventure and wine, the German National Tourist Office invited me to hike part of the long distance trail to celebrate the Rheinsteig’s 10-year anniversary. Tim is the hiker, tackling long distance trails like the Dolomites Alta Via 1 and hiking Rim to Rim to Rim in the Grand Canyon without a second thought. I’ve never hiked long distance over multiple days and I rarely hike completely by myself. I mean, have you seen 127 Hours? Reassuring myself that Germany wouldn’t want to lose their blogger somewhere on the trail (at least that’s what I told my mom when she was upset I was doing this solo), I signed on to tackle nearly 40 kilometers of the Rheinsteig over two days with my four-legged sidekick, Emma. There is hardly a more spectacular setting than Romantik Hotel Schloss Rheinfels. 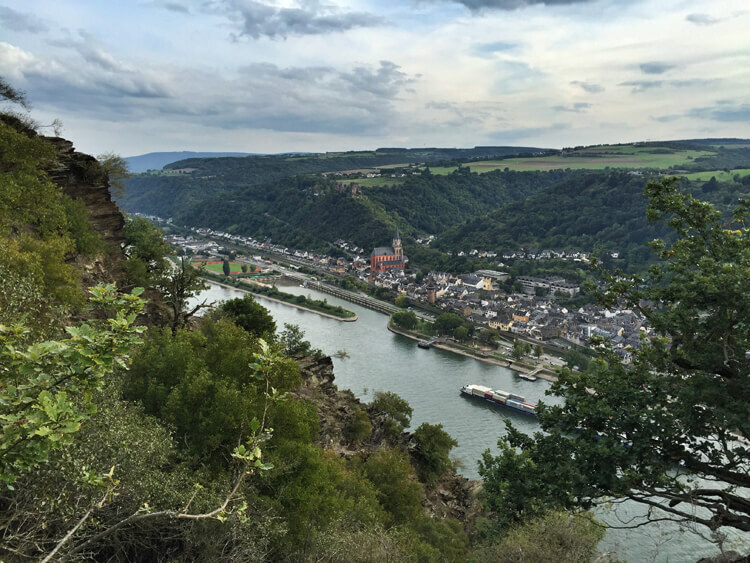 Situated above the Rhine with views of two other castles, Katz and Maus, on the opposite bank and the Rhine’s largest castle ruins literally out my doorstep, I was completely enamored from my moment I arrived in St. Goar. Burg Rheinfels is the largest and most imposing castle on the Rhein. It was built by Count Diether V von Katzenelnbogen in 1245 to protect St. Goar’s tax collectors. It was such a mighty fortress that it resisted an attempted siege by the League of Rhenish Cities for more than a year. Ownership of Burg Rheinfels passed to the House of Hesse in 1479 and it was turned into a Renaissance Castle. Though it doesn’t necessarily sound so exciting labeled just large cellar on the map, be sure to wander down and have a look. It’s the largest self-supporting vaulted cellar in Europe. It’s impressive with a length of 24 meters (79 ft), a width and height of approximately 16 meters (52 ft) and walls 3.5 meters (11 ft) thick at the bottom. When Louis XIV sent French troops in in 1692, it was the only fortress on the left bank of the Rhine River that could defend itself. Just over 100 years later, in 1794, Burg Rheinfels was sadly handed over without a struggle to the French revolutionary army and they blew it up a mere two years later. Though most of the castle now lay in ruins, I could totally imagine what the Renaissance Castle must of looked like in its heyday. Especially staying in the restored hotel part, opened in 1973, that is totally fit for a princess. With a spa complete with pool, hot tub, steam room and relaxation garden overlooking St. Goar and the Rhine below, I hardly wanted to leave. This was truly the best castle hotel I’ve ever stayed at, and I’ve stayed in my fair share. I’d been told that the approximately 20 kilometer hike from Burg Rheinfels in St. Goar to Dörscheid, the first section I’d be hiking, was one of the most picturesque of the Rheinsteig. It definitely did not disappoint. I woke up a little disappointed. I opened my curtains to a fog so thick I couldn’t see the castle’s terrace just two floors below me. My Rheinsteig Hiking guidebook promised one of the best views, known as the Dreiburgenblick three-castle view was just 3.5 kilometers in to my hike. By 9:30am the fog hardly had lifted, but I couldn’t wait any longer. I had 20 kilometers ahead of me and already Fall, sunset was at 7pm. 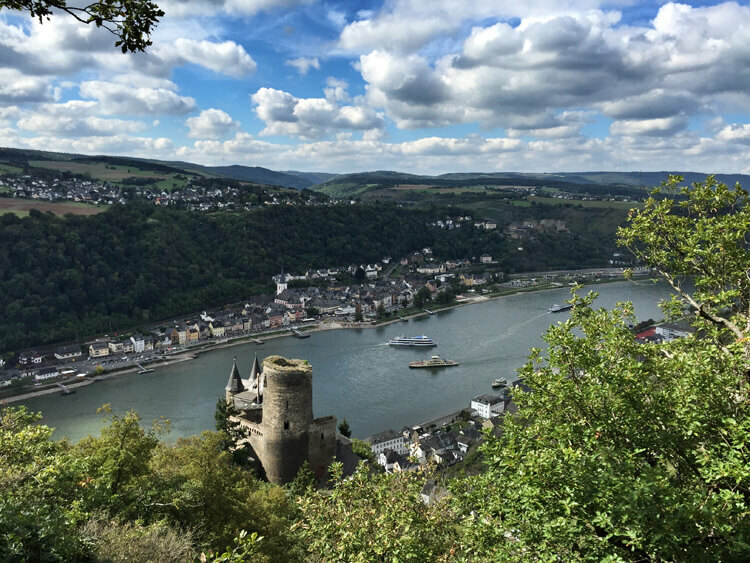 Thankfully, by the time I hiked down to St. Goar from Burg Rheinfels, crossed the Rhine on the ferry that crosses back and forth every 10 minutes and had reached the actual trail head, the fog had lifted and only a few puffy white clouds dotted an otherwise brilliant blue sky. The first few kilometers took my dog, Emma, and I through thick forest and the shade from the tall trees was welcome as we climbed from the river bank to the Dreiburgenblick lookout. I quickly peeled off my fleece as we climbed the switchback trail through the forest. The Dreiburgenblick lookout was definitely worth the effort with gorgeous views of the glistening Rhine, Burg Rheinfels across the river, and Katz and Maus castles to my left and right. Emma and I took a few minutes to have a snack and appreciate the view. I’ll admit that as the trail opened up to a paved road that took us to the edge of the village of Patersburg, I got a little lost. There didn’t seem to be any other way to go and so Emma and I continued on toward the village. As we came to the first houses, I started second guessing myself and turned around walking nearly all the way back to the Dreiburgenblick lookout. My map made it look as though as I shouldn’t be walking through the village and a valley separated us from Katz Castle, where the trail passed right by. Tim is normally the navigator when we hike and I started to worry about what I’d gotten myself in to. I wasted around an hour trying to figure out where the trail picked up and descended back to the river. 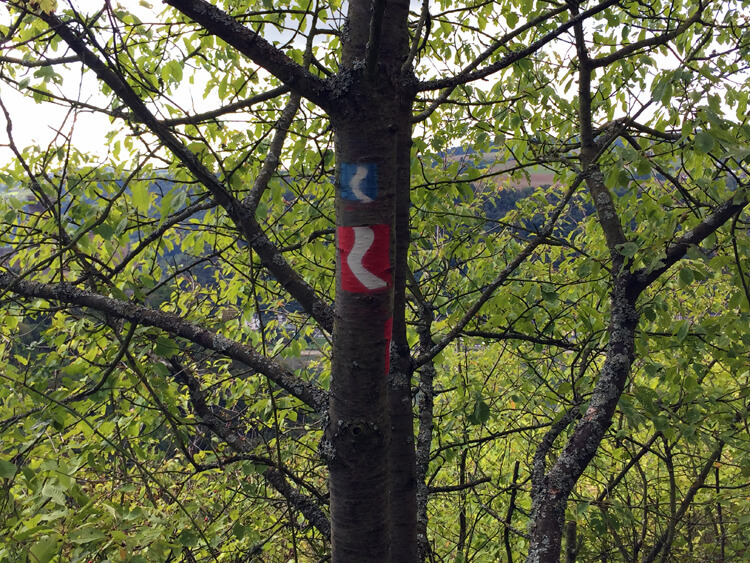 On my second trip through Patersburg, I noticed the Rheinsteig logo on stickers on the street lights and the trail picked back up in a vineyard. That little blue and white logo quickly became my reassurance that I was headed in the right direction and I looked for it for the next two days. We descended all the way back down to the river through vineyards before beginning the climb up the next hill to Burg Katz. My knees were already aching from the steep descent but Emma ran ahead, urging me on. Soon we were at the gates of Burg Katz, built in 1360 by the counts of Katzenelnbogen. 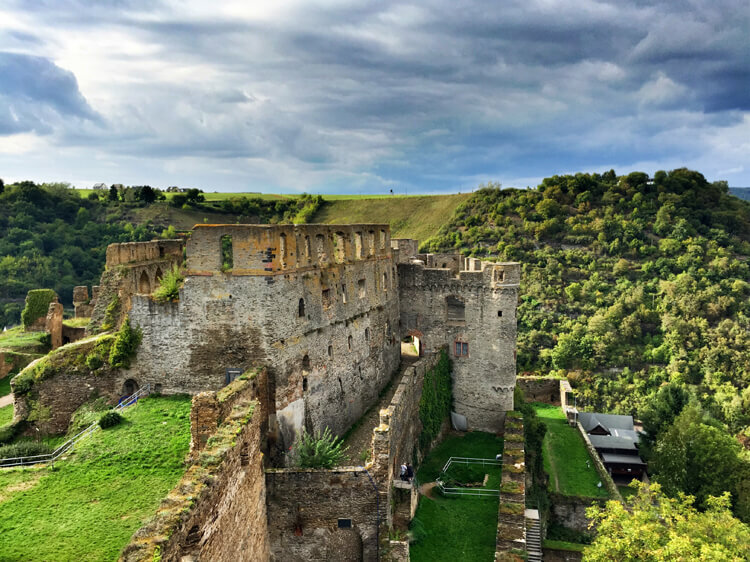 It was enlarged in the 17th and 18th centuries and served as an outpost of Burg Rheinfels, protecting St. Goarshausen on the left bank of the Rhine. It was destroyed in 1806 on the order of Napoleon, but reconstructed in its original state in the 19th century. A Japanese businessman bought it and Burg Katz is privately owned, so it’s not possible to visit it. Up to the top of the hill and back down the other side we went, passing through another quiet tiny village. The locals must see us hikers trudging through with our backpacks every day, but a few had to stop and check out Emma with her Ruffwear pack. She has to pull her weight and carry her own food and bowls, after all. After ascending again to another lookout point, we came to the Lorelei. It’s a famous rock soaring 120 meters above the waterline. The most famous feature of the Rhine Gorge, Lorelei marks the narrowest part of the river between Switzerland and the North Sea. There’s also a tale that the sailors coming up the river would see a beautiful blonde Rhinemaid (mermaid of the Rhine) that would bewitch them and cause their death. Needless to say, Emma and I were glad not to see her. No one needed to die in the forests of Germany never to be seen again. My knees finally got a break as the trail leveled out for quite a while and the trail took us through the vineyards. I particularly liked this part of the trail. The sun was shining overhead and we walked a path right through the rows of grapes that climbed straight up the hillside from the riverbank. The harvest was just beginning here in the Middle Rhine, so I spotted workers handpicking the plump grapes. Each grape varietal was marked with cute signs that told a little about each grape. They were in German, but I could appreciate the thought. We were able to move much more quickly on the even trail and while it had taken me nearly three hours to hike just 8 kilometers earlier in the day, I ticked off the next 5 kilometers easily in under an hour. Emma and I took advantage of a picnic table with a nice view of the river to enjoy my packed lunch provided that morning by the Romantik Hotel Schloss Rheinfels. The next 7 kilometers were my least favorite part of the trail. Again we started ascending and spent the entire time ascending and descending in the forest. It was late in the afternoon and we hadn’t seen any other hikers in quite a while. I picked up my pace. Suddenly Emma was staring intently at something that I wouldn’t have noticed otherwise. There in the distance I could see a wild boar. In any other circumstance, I’d be excited. But I grabbed hold of her, put her leash on and got the hell out of there. Wild boar can be dangerous if they feel threatened and I didn’t want to be anywhere around. I couldn’t have been happier to finally get out of the forest and spot Oberwesel across the river from the RoBsteine lookout. Only a few kilometers left to go and just one more ascent for the day. My legs were tired. Emma was tired. When the town of Dörscheid finally appeared, I couldn’t propel my legs forward fast enough. I was thrilled to finally reach my hotel, Landgasthaus Blucher, and drop my backpack on to the ground. Who says you can’t have a gourmet feast while hiking? I was so tired, I almost skipped dinner just because I didn’t want to walk the 50 meters from my room back to the main lodge’s restaurant. But I’m so glad that I forced myself back up because dinner was delicious. I had venison with freshly foraged mushrooms in a red wine sauce. 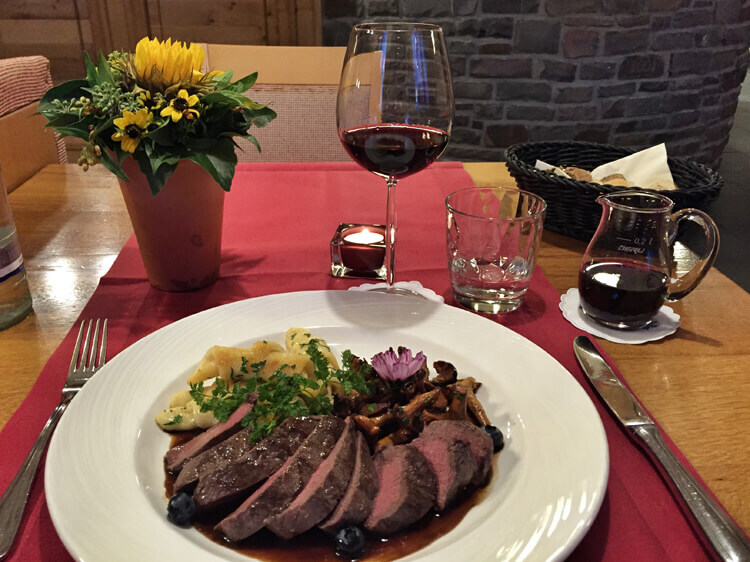 Landgasthaus Blucher is also a small family wine producer and I had their very own Rotwein-Cuvee , a delicious red wine that paired wonderfully with my venison. And then I passed out for the night. Unfortunately, the fantastic weather I’d had on the first day didn’t last and I woke up to a light rain. I wasn’t keen on hiking another 18 kilometers in the rain, but Dörscheid is located on an alpine hill above the river and is one of the few towns inaccessible by the KD Boats traveling up and down the Rhine or by train. I had no choice but to hike in the rain for at least part of the trail. Emma and I pulled on our packs and set out for Kaub. What started out as a light rain that wasn’t so bad as we made our way through the Riesling vineyards with views of the Gutenfels and Pfalzgrafenstein castles turned to pouring rain for the last two kilometers as we descended down in to Kaub. In Kaub a little ferry boat brings visitors the short five minutes to Pfalzgrafenstein, a castle on a tiny island in the middle of the Rhine River. Built by King Ludwig the Bavarian in the 1300s, it once was used as a toll collecting station from its strategic location in the middle of the Rhine. Since Kaub isn’t a regular stop for the K-D Boats, Pfalzgrafenstein isn’t visited by the crowds that descend on some of the other towns. 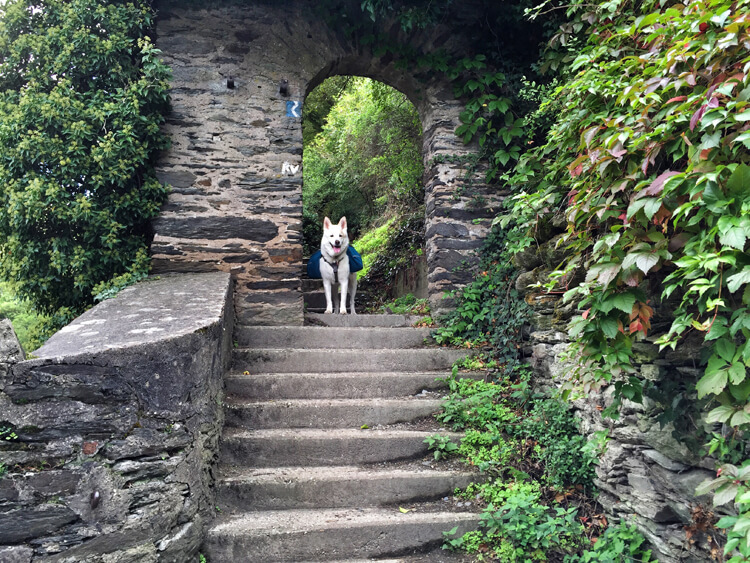 Emma and I escaped the rain with a visit to the compact little castle. If ever there were a castle that you could call cute, this is surely it. Rooms on three floors wrap around a central courtyard. Most of the rooms are sparsely furnished, but you can find some cannons and torture devices in the castle. There is also a tower that you can climb for views to the vineyards. The castle can be thoroughly explored in about 30 minutes, just in time for the ferry to arrive and take you back to Kaub. Or you can utilize the picnic tables in the courtyard for a rest and a snack. And that’s just what Emma and I did to see if the rain would let up. It didn’t and instead of being soggy and miserable for another 13 kilometers that we had yet to go, we hopped on the train. A few other hikers on the train told me I was crazy for hiking what I had in the heavy rain and it made me feel better for throwing in the towel, so to speak, and not finishing the hike. In Lorch am Rhein, we visited another small family run winery. 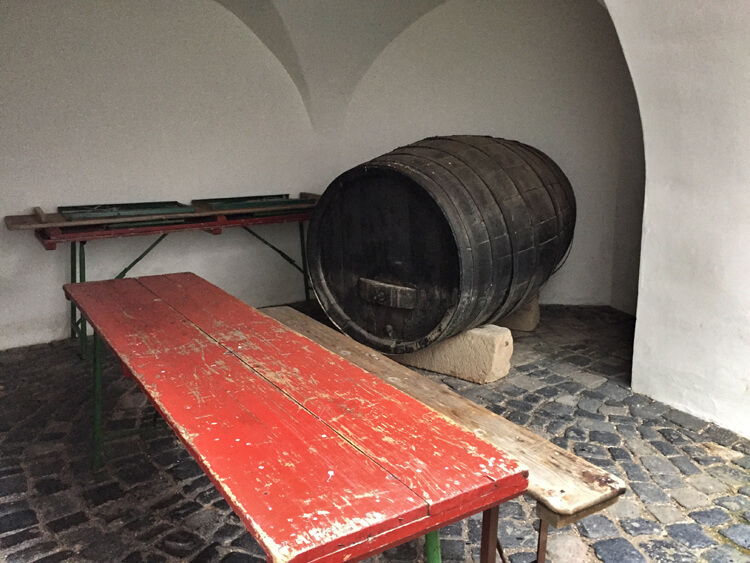 The previous day they had harvested Silvaner grapes the previous day and the winemaker, Michael, filled a wine glass with the fresh grape juice that had just been pressed and pumped from the press to the tanks. I’ve never tasted grape juice fresh out of a press before and was surprised just how sweet and delicious it was. Michael and his wife, Jacqueline, welcomed me to their restaurant for dinner. There was no doubt that this was the place to be in Lorch. Every table was filled with locals coming in to socialize and have a bite to eat. I sat at one of the communal tables with a group of locals that mountain bikes the Rheinsteig trail every week. They too told me I was nuts for hiking the 7 or so kilometers I had in the heavy rain. They’d gone just 0.2 kilometers and decided wine and hot food was far better a way to spend their day. Jacqueline’s father-in-law, who didn’t speak a lick of English, first had me try his favorite rotwein (red wine). Then came a glass of Silvaner. Then I just had to try something that is between a wine and a beer, the “first” wine of the new barrels before it’s completely done in the wine making process (in other words more alcohol than wine!). And then the most special wine of all came – a 1999 ice wine from when it had snowed and the grapes froze on the vines. I spent my evening eating, drinking far too much wine and hearing all about the history and stories of what I’d just hiked from the locals that call these small, yet charming villages home. I couldn’t think of a better way to end my brief time in the Middle Rhine. The next day my feet really got a rest as I sat back on the KD Boat and cruised past the castles and towns I’d spent the last two days hiking through. And in case you were wondering, my contact at the German National Tourist Office did check in with me to see how it was going and ensure I’d made it to where I was suppose to each day. Purchase the Rheinsteig Hiking pocket guide and read up on each section of the trail you plan to hike. This book was invaluable in knowing what the trail should look like and what lay ahead. Pack lunches are available for purchase from any of the Rheinsteig partner hotels and guest houses for each day. Bring 2-3 liters of water per person for each day. You can use the KD Boat to move about the towns on the Rhine. We drove and parked in St. Goar, so took the KD Boat to return to St. Goar. Pfalzgrafenstein Castle is open from 10am – 5pm Tuesday – Sunday in March, 10am – 6pm Tuesday – Sunday April – October, 10am – 5pm weekends only January, February and November. Closed December. The ferry is €2.50 and admission is €5. Burg Rheinfels is open from 10am – 6pm daily March – October, 10am – 5pm daily October – November and opening hours vary from November 9 – March. Admission is €5. This is a UNESCO World Heritage Site. For more info click here. You can see all the UNESCO World Heritage Sites we’ve visited here. My Rheinsteig trip was provided by the German National Tourist Office in order to bring you this story. However, Luxe Adventure Traveler maintains full editorial control of the content published on this site. As always, all thoughts, opinions, and enthusiasm for travel are entirely our own. This article contains affiliate links. When you book on Booking.com through our affiliate site, we earn a small commission at no additional cost to you. Oh gosh what a gorgeous trip – the food looked amazing and the wine! Wow, thanks for sharing the great adventure! Wow, the food, the views and the wine all look incredible! This is definitely on my travel bucket list as I would love to explore the Rheinsteig Trail. Thanks for sharing your trip with us! I’m adding this to my “Need to Visit” list! Beautiful scenery, delicious food and the wine looks amazing! Wow!! I am completely blown away by the beauty! I visited Germany in 2001 but would love to go back one day! What an absolutely beautiful place to visit, those views were incredible. I’ve been to Germany once and would love to go back. It’s on my travel bucket list! It always warms my heart to see pictures of my home 🙂 The Rheinstag trail is breathtaking and you’ve captured it beautifully! The Rheinsteig Trail isn’t super popular, so you should be able to find accommodation in most villages without needing an advance reservation. This will also depend on when you plan to do the trail as August will see many more hikers than mid-September when I hiked the trail. Will you be packing with all of your gear the entire time then? If you do use a porter service as I did, you do need to know where you are stopping the next day for the porter to transfer the bag.